Anthropophobe are one of the outfits by KFD aka Vordak, who’s in the mighty project Pagan Assault too (enter the band’s name in the ‘search’-tab to find some of the reviews I did for them). On January 12th 2016 I did upload a review for the Extinct Species EP, which he did release under the K.F.D.-moniker, and he’s the guy who runs Soleil Blanc Productions and Germanordic Recordings (cf. that K.F.D.-release) as well. With Anthropophobe, there were some excellent releases before too, and I can refer to a review for the albums Le Royaume Des Morts or When Darkness Returns / Déceptions Et Trahisons, both of them uploaded in October 2014, on the 12th and the 26th respectively. This review deals with a (new) digital EP, Un Trou Dans Le Sol (Constant d’Échec Et Compensations Matérialistes), a five-piece recording that lasts for less than a quarter of an hour. The material was recorded at the ClaustroStudio (the name of this studio is something that totally fits to KFD as a (human) being). 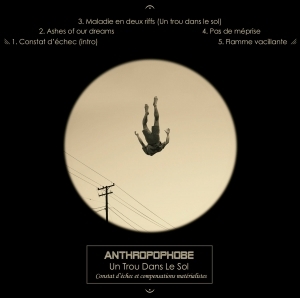 After a short and bizarre intro (Constat D’Échec), based on synths with a strange sound (something à la mellotron or Hammond), Anthropophobe perform quite simplistic (this is NOT meant the negative way! ), raw Black Metal with hints of Pagan-Black supremacy. The riffs are somewhat repetitive, which strengthens the grim and arctic atmosphere for sure. The drum parts did approve a lot, I think, for they are now a prominent element in the whole experience. Vocally, KFD still sounds hoarse, raw, soar and skin-scraping, like the earliest Black-Thrash entities that did (de)populate our fabulous globe. The sound is the opposite of ‘clean’, lovely unpolished and primal, which evidently fits to the primitive and somewhat grotesque hymns. Personally I think the highlight is Flamme Vacillante (the longest piece, by the way), and especially the outro closes this digital EP with pride and conviction. Like the former Anthropophobe-stuff, Un Trou Dans Le Sol (Constant d’Échec Et Compensations Matérialistes) still dwells within spheres of the earliest nineties, finding inspiration in the scenes from Norway, Finland and so on. And yes, it has been done before, since the quality of the aural result is remarkably attractive, je m’en fous.